Thanks to Pinterest (oh the ever wonderful Pinterest) I found this recipe. I am not a fan of Enchiladas, never really had been, but the cheesy goodness this blog depicted was irresistible. I mean, look at that cheesy goodness! 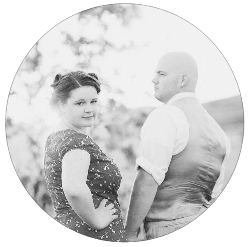 Photo from this lovely blog! After seeing said photo, I found my self desperately craving something warm and ridiculously cheesy. So of course, I made it. It's a super easy recipe. Super Easy. Preheat oven to 350. Spray 9×13 baking dish with Pam. Melt butter in large skillet over medium heat. Add rotel and saute 1 min. Stir in cream cheese and chicken and cook, stirring constantly until cream cheese melts. Spoon 2-3 tablespoons of chicken mixture down center of each tortilla. Roll up tortillas and place seam side down in a lightly greased 9×13 baking dish.Sprinkle with Monterey Jack cheese, and drizzle with whipping cream.Cover with foil and bake at 350 degrees for 30 min. Take off foil and cook for another 15 mins, or until top is golden brown." The recipe is very similar to whatever Enchilada recipe my mom uses. I really should have added a lot more cheese to my Enchiladas. Lesson learned. But all in all, they were very tasty and I highly recommend them. The internet is sooo awesome for finding such easy, yummy recipes. This blog is full of them! And you can't beat yummy and easy! 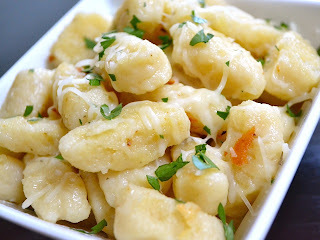 Homemade gnocchi --- I love gnocchi (small cheese or potato filled noodles) but have never been brave enough to try to make my own. But then (again thanks to Pinterest) I found this wonderful recipe with very detailed step by step instructions! The blog it's self is Amazing. And I particularly love how it is so Price Focused. Check it out. *gasp* I love cheesy enchiladas!